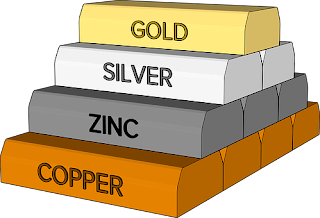 There are two types of metals used in jewelry - Fine Metals and Base Metals. Sterling/Fine/Argentium Silver and Rose/Yellow Gold are considered Fine Metals. Copper, Nickel, Zinc and Aluminium are considered base metals. Some people are worried about the zinc alloy jewelry safety. They are afraid that wearing zinc alloy jewelry will give negative effects on their health as wearing lead alloy jewelry does. Some jewelry seller said that they sell zinc alloy jewelry when actually they sell lead alloy ones. Lead alloy is cheaper but it can cause some side effects. If you are worried about the safety of the metal jewelry you wear, check this out. Many people are wondering about the safety of cheaper jewelry such as zinc alloy jewelry. Well, that jewelry safety depends on the substance found in the alloy. The alloy used in making them is usually made of a mix of two metals. These metals may have some side effect on your skin. Here are some metal found in jewelry. Nickel is easy to shape and durable. It is also cheap. That’s why nickel alloy is used in metal jewelry. This metal is non toxic. However, it can cause allergic reaction for some people. Wearing this particular jewelry pieces may cause atopic dermatitis. Copper is often used in metal jewelry making because it is yellow and similar to gold. This metal is quite harmless. It is non toxic and doesn’t cause allergic reaction for most people. Copper allergy is very rare. Lead is cheap and mouldable. As a result, some jewelry manufacturers use it to create their products. This metal is toxic. In children, it can lower the IQ. Adults may have less concentration ability if they suffer from lead poisoning. They can get it when they eat something using their lead contaminated hands after handling lead alloy jewelry. Zinc is harmless. There is no allergic reaction or other side effects report about this metal. As a smart shopper, you must be able to differentiate which is true zinc alloy jewelry and which is lead alloy jewelry. Here are some of the things you must look closely when you are shopping for metal jewelry. The appearance of zinc alloy and lead alloy jewelry is slightly different. The ones made of zinc are usually not shiny. It even tends to be dull. Zinc alloy can have shiny look after it is processed with die casting method. Meanwhile, lead alloy jewelry is very shiny. Another thing you must pay attention is the smoothness of the surface. Zinc alloy jewelry is not very smooth. It is due to the level of its hardness. As a result, it is more difficult to shape and smoothen. However, the ones made of lead alloy are very smooth. That’s because this material are softer and easy to shape. Zinc alloy jewelry pieces are lighter than the lead alloy ones. If you happen to find similar size and shape jewelry pieces have different weight, you must choose the lighter one. When you shop for metal jewelry and find shiny beautiful jewelry pieces in cheaper price, it is better for you not to buy them. It has high possibility that they are made of lead alloy. To ensure your safety, choose lead free zinc alloy jewelry pieces. Zinc alloy jewelry pieces may be a bit more expensive and not very beautiful. However, wearing those jewelry pieces is perfectly safe. You don’t need to worry about allergic reaction or metal poisoning. To ensure the quality of the zinc alloy jewelry you buy, you must shop for it from a trusted store. You must also check the manufacturer. It is better for you to choose a metal jewelry piece which is made of developed country with good reputation. Now, you don’t need to be concern about the zinc alloy jewelry safety. So you may be wondering why I'm posting this information! 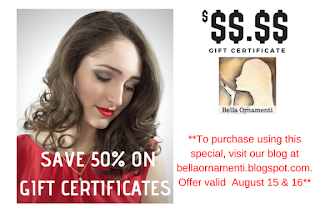 Well, Bella Ornamenti is coming out with a cool new line of Zinc based jewelry. I wanted to give you the heads up on Zinc and how safe it is for jewelry before the line launches! So keep an eye out! !